PHUKET, KAMALA: Roads in Kamala have been blocked by protesters since yesterday evening. 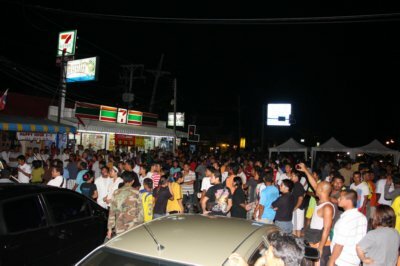 About 400-500 Kamala residents gathered at an intersection near Phuket Fantasea at 8pm on Tuesday evening to protest the local police station’s handling of crime in the area. The protests began at 7pm when a crowd gathered outside the station. The protesters later set up tents and loud speakers at two of Kamala’s main intersections and look set to occupy the areas for several more hours.